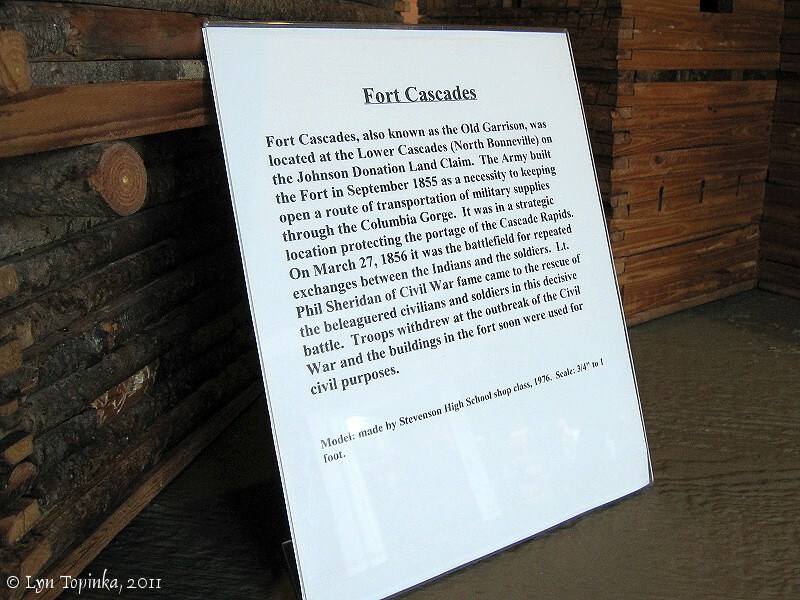 "Fort Cascades, Washington ... (Lower Blockhouse)"
Click image to enlarge Fort Cascades area. View from downstream on Hamilton Island, Washington. Image taken July 2, 2006. Fort Cascades, also known as the "Lower Blockhouse", was located on Hamilton Island downstream of the Bonneville Dam. 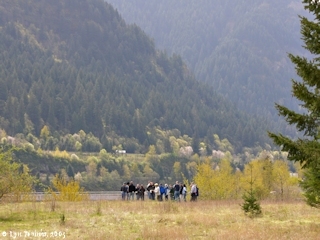 Tanner Creek, Lewis and Clark's campsite of April 9, 1806, is located across the Columbia on the Oregon side. Fort Cascades was built overlooking the Columbia River, at River Mile (RM) _____. The compound was enclosed by a fence measuring 590 feet on the north by 338 feet on the west. The south and the east were bordered by the Columbia River. Stuctures included in the compound included the commanding officer's quarters, officers' quarters, commissary storehouse, company kitchen, bakery, and guard house. The fort was completed on September 30, 1855 and was built to guard the portage road around the Cascade Rapids. Slightly upstream the town of Cascades, also known as "Lower Cascades", was developed around the fort. 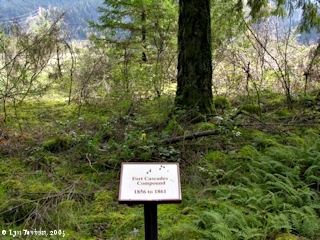 In March 1856, Fort Cascades burned during an indian attack known as the Cascades Massacre. It was rebuilt. In 1861 the Army abandoned the fort to turn its attention to the Civil War. In 1894 the largest recorded flood on the Columbia River wiped out the town of Lower Cascades and the abandoned fort. Click image to enlarge Sign, "Fort Cascades Compound, 1856 to 1861", Hamilton Island, Washington. Image taken April 2, 2005. Click image to enlarge Location of Fort Cascades, Hamilton Island, Washington. Image taken April 2, 2005. 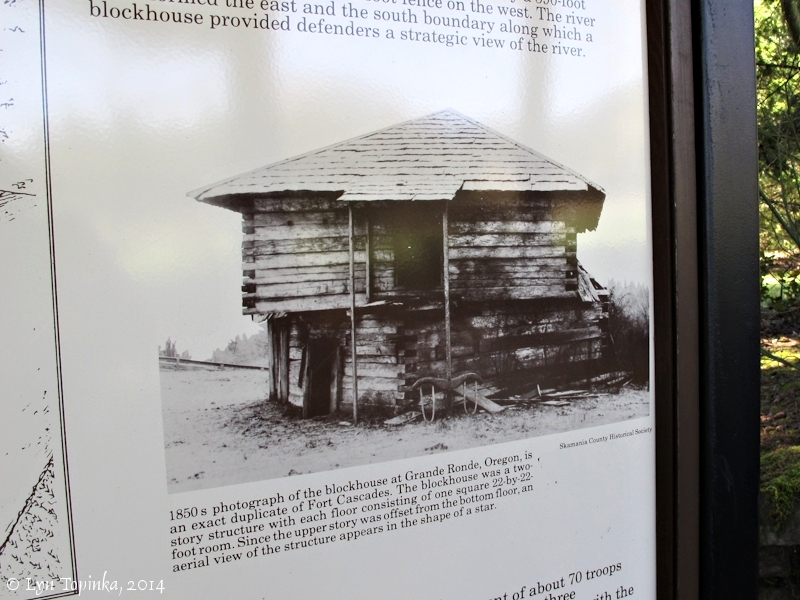 The blockhouse located at Grande Ronde, Oregon, was an exact duplicate of the blockhouse at Fort Cascades. Each blockhouse was a two-story structure with each floor consisting of a 22 by 22-foot room. The upper story was offset from the bottom floor, resulting in an aerial view of the blockhouse appearing in the shape of a star. Click image to enlarge 1850s image of the Blockhouse near Grand Ronde, similar to the Fort Cascades blockhouse, Hamilton Island, Washington. Detail from information sign, Fort Cascades Historic Site, Hamilton Island, Washington. Image taken April 7, 2014. 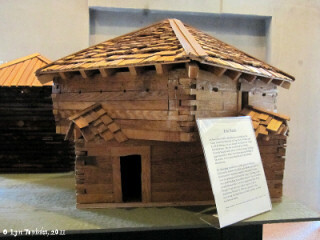 Click image to enlarge Model, Fort Cascades, Columbia Gorge Interpretive Center, Stevenson, Washington. Image taken July 15, 2011. Click image to enlarge Information sign, Fort Cascades, Columbia Gorge Interpretive Center, Stevenson, Washington. Image taken July 15, 2011. In July 1850, George W. Johnson filed the first Donation Land Claim (DLC) in the Cascade Rapids area, for 320 acres of T2N R7E, Sections 17, 20, 21, and 29 (area now called Section 38). At the same time the area was platted as the town of Cascades, Washington Territory, becoming only the third town north of the Columbia to be platted. Johnson built a home, and with others, built a trading store, bakery, and public house for travelers. In 1855 the U.S. Army aquired the land from Johnson for their fort site. 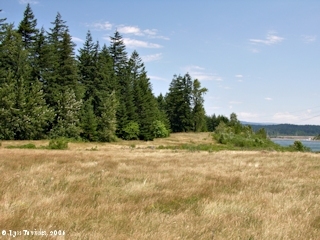 At the time the Army moved onto the Johnson Land Claim the property included a wharfboat, three buildings, and a small field enclosed by a split fence. The town of Cascades developed around Fort Cascades, and took over the buildings when the Army moved out. The 1880 census showed 134 residents of the town. Cascades was destroyed in the Flood of 1894 and never rebuilt. The "Great Flood of 1894" was the highest-recorded flood along the Columbia of all time. This flood destroyed the town of Cascades. Downstream, a gage at Vancouver, Washington, reached a record 36 feet, while Longview, Washington hit a record 24 feet (June 7, 1894). The force of the flood waters removed several feet of soil and exposed many boulders now visible in the area of Fort Cascades. The Fort Cascades Historic Site is located one mile downstream (west) of the Bonneville Dam, and is reached from the Dam Access Road on Hamilton Island, off of Washington State Highway 14. 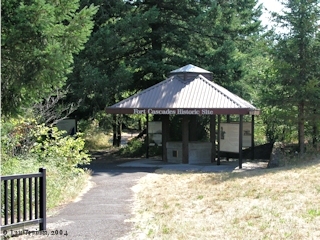 The site is on the Register of Historic Places, and features a 1.5 mile interpretive trail which leads to the Cascades Townsite and Fort Cascades Compound. The trail follows the bed of the portage railroad as it was in 1836. 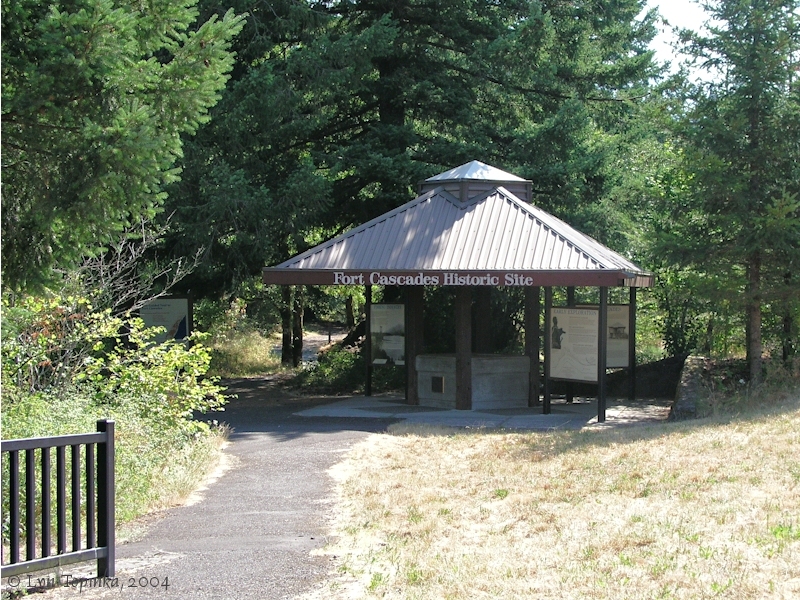 Click image to enlarge Kiosk for Fort Cascades Historic Site, Hamilton Island, Washington. Image taken August 1, 2004.